I remember having a Cozy Coupe when I was younger. It was absolutely fantastic looking back. One of the big old classic red and yellow taxi models - most likely completely impractical and absolutely useless to those without a big clear patch of land in their back garden - but a toy that single-handedly made my childhood. For sentiment, I wish I could buy one for Harrison. To this day I still remember spending hours in that little car and I'd love for him to have the same, but it just is not practical for us. 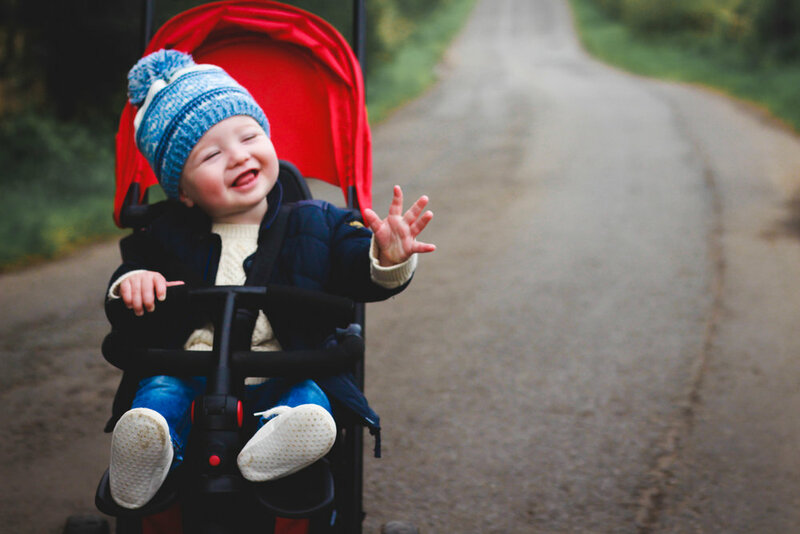 With his birthday less than a month a way, I've been looking at alternatives, mainly the smarTrike but I have a tiny car - I've spoke about this a lot when discussing our pram choices. My boot is not made to fit an oversized handbag, let alone a trike for a toddler, and again I wondered if the use we would get from a trike would be limited to the ten minute walk from our house to the local Morissons'. In almost the nick of time, smarTrike released the newest trike, the smartFold, and finally I felt like there was a product that might actually work for us. Had I any amount of self control, I would have waited and given Harrison his smarTrike for his birthday, but alas I’m impatient and I wanted to see his face light up in the exact same way mine did with my Cozy Coupe, even if that meant having to come up with another present idea for three weeks time. I wanted our first outing with Harrisons' new trike to be at the beach. I couldn't tell you why, but I had been desperate to go to the beach for weeks and I felt like this was the perfect excuse. Jordan however didn't agree, and roping him into a beach trip in the middle of September, on a dreary Sunday in Scotland was never really going to happen. I’ll give you one guess as to what his response was, but I can assure you it was not an eager yes. Trying to avoid the forty minute drive to the beach, Jordan promised to take us somewhere better and we set off in the car. I should never have trusted him, but low and behold he dangled a Wind Farm (with beautiful views) in front of my face and I followed blindly behind. Jordan drove us a whole 5 minutes from our house to a little town nearby, and said this was the closest place to park our car to visit this Wind Farm. I only wish I’d realised he didn't have a clue where this wind farm was and he was doing anything he could to avoid driving to me at this point, but low and behold I was completely unaware and duly stood at the side of the road with our unassembled smarTrike ready for an adventure. The smarTrike comes conveinently packed in a netted bag, and can be wheeled along. This would make it super easy for traveling on public transport with, but it's not really something we've gotten use out of. If I had one tip for anyone buying a smarTrike smartFold it would be to not try and assemble the thing for the very first time at the road side with no instructions. It's simple when you know what your doing, but it's much easier to do it in the comfort of your own back garden. I cannot comment on the instructions, as we felt we were more than capable of doing it from eyeballing (and we were, albeit with a few swear words thrown in). It wasn't difficult to assemble, but in the first instance it's not a case of pressing a button and having it all fold out. We've been using our smarTrike now for nearly two months, and not once have we managed (or really tried) to put it back in the portable little netted bag. This works for us though, it still folds down extremely compactly, we don't remove any wheels and it's a case of simply expanding it all. If we were traveling further and wanted to wheel it, then the option of putting it into the case is there, but for now it's a bit of a faff for a trip to the park. We walked for forty minutes in one direction with Jordan claiming he knew exactly where he was going. I now realise he had no more idea than I did, and rather than previous knowledge or any sense of direction, he was relying on the wind turbines in the distance. This would have been fine, had we not still had the journey back to do and a baby who would inevitably get hungry, or tired, or uncomfortable in the plastic bike we'd decided to try for the first time. The trike is comfortable enough, within reason. The smarTrike is not padded, it is completely made of plastic and it is not made for little bums to be sat on for the best part of two hours. Not once did Harrison gurn on our journey, he was happy enough sitting unrestricted and to look around while we maneuvered the country roads. The ability for him to either let his legs dangle as we wheeled him along or to pop them on the leg rests and sit back meant he was happy enough and he did not complain once. I never thought I’d have to comment on the comfort for extended journeys, but if you are thinking of buying one you can be content in the knowledge that you can get yourself lost on country roads for two hours and your little one will be comfy enough. After endless complaints from myself, Jordan eventually took us on a sharp right up towards a little farm, and finally it felt like we were getting somewhere. The smarTrike is not built for off-road adventures. It is a trike made for roads, not mucky farms that toddlers happen to find themselves knee deep in by accident. At this point, Jordan still claimed he knew exactly where he was going and this was an intended shortcut, or at least, he did until someone who obviously worked on the farm drove by us on a quadbike looking somewhat confused. You would have thought they would have told us that we were very much on private land, but alas, they let us walk further into the muck and only when we hit the farm dogs did Jordan put his hands up and admit that we had probably taken a wrong turn at some point in the journey. The smarTrike at this point was still holding it’s own, despite wading it through god only knows what, we had no problem steering or manoeuvring it. The only problem we encountered was the convenient bag that straps onto the back of the trike. It’s very convenient provided you are not bumping up uneven surfaces or ankle deep in muck, and although it is great for storing different bits, it hangs low to the ground and can drag if the ground is not even. Our bag survived, and the material is such that a quick wipe down with some baby wipes brought it back to life, but next time I wouldn't even risk it. Tip number two, if your considering taking your trike to a farm, take the storage bag off. At this point in time, I had my tantrum about what can only be described as a bit of a failed adventure, and we set off on our journey home. I hate to admit it, but sometimes the unplanned adventures can be the best ones. It can be so easy to focus on going on real 'day trips' or seeing new places, that we forget about the places around us. The wind farm is the perfect example, it may not be a glorified castle, but it's something to see, and something I haven't seen in the twenty years or so I've lived in this town. Despite not even getting to the wind farm, sometimes fresh air is enough and we had a good day when we finally did manage to get home. Although I didn't quite get my calming beach trip, and I certainly didn't get to see the wind farm I was promised instead, we got out in the fresh air, found a farm we never knew existed and well and truly put the smarTrike through it's paces. I can't recommend the smarTrike smartFold enough - it has all the features of the normal trike, but is portable, and that really does make all the difference if you want to venture further than your own neighborhood. You can pick up the smarTrike smartFold from Argos here.